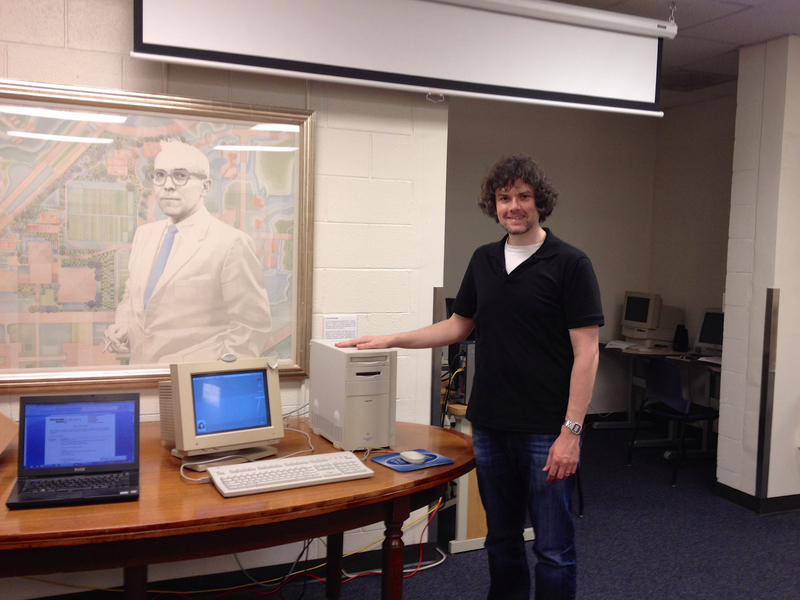 Me and the Power Macintosh 8500/120 in the Georgia Tech Library Archives. When I met with Georgia Tech Library Archives’ Department Head Jody Lloyd Thompson and Digital Collections Archivist Wendy Hagenmaier to donate three vintage computers (a Dell Dimension 4100, Apple Performa 550, and Apple iMac) and other computing hardware a week and a half ago, I noticed that they had room for one more computer, so I pitched them the idea of my making another donation to fill the gap between the Performa 550’s 68030 processor and the iMac’s G3 processor: an Apple Power Macintosh 8500/120. They agreed to accept, so I set about preparing the computer for them. My Power Macintosh 8500 was in very good shape, but like many vintage computers with persistent clocks, it needed a new lithium battery. 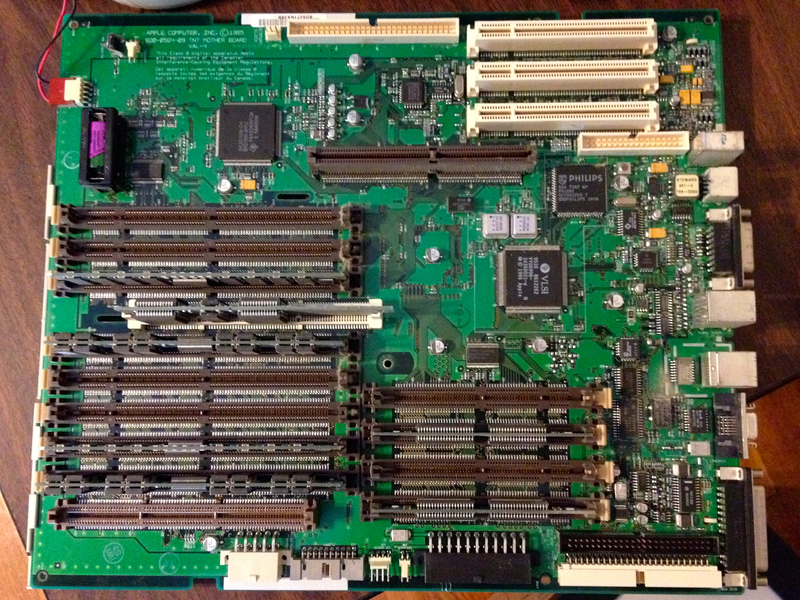 To replace the Power Macintosh 8500’s on-board battery (upper left corner of photo), you have to remove the motherboard. I replaced the battery, installed Mac OS 7.5.5, a number of different software titles (including Apple’s Plaintalk Speech Recognition–I threw in a Plaintalk powered microphone, Project X/Hot Sauce, and Cyberdog). I discovered that the plastic inside the case did not age well. The PowerMac 8500 has a lot of plastic components that are held together with flexible tabs or clips. When I applied a small amoung of pressure on the tip of these clips to release them, most of them would break. Luckily, the case ties together very well, so I only had to piece some parts back together with clear tape (the power button/light assembly) and metal duct tape (one drive plate cover on the front of the case). To help dissipate heat, I added a rear slot fan made by Antec. I made a video demoing the finalized system, which I’m including embedded below (I apologize for the flicker, but my digital camera doesn’t have enough adjustment features to match the refresh rate on the Apple 14″ Color Display). In addition to the Power Macintosh 8500, I gave the Archives a box full of software and late-1990s/early-2000s video games for Macintosh. These might help facilitate more connections around campus (Computer Science, Media Studies, and Game Studies). 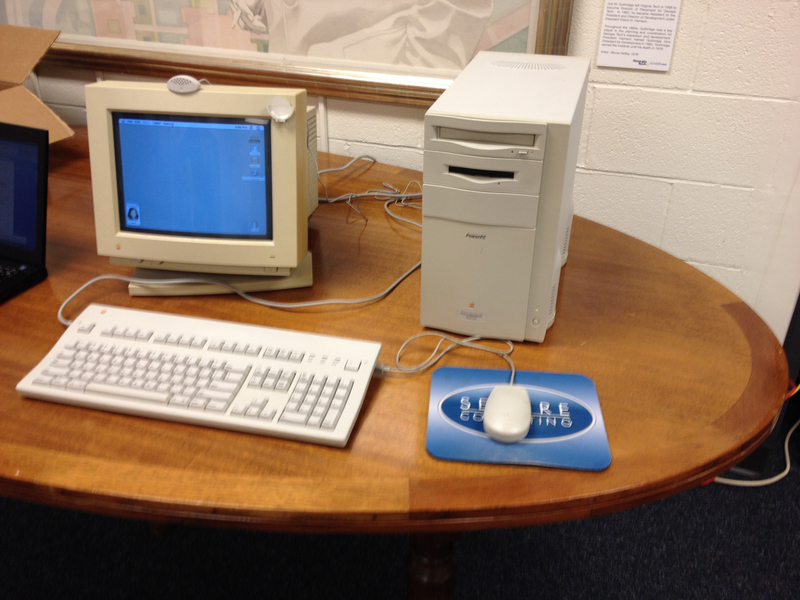 As I’m leaving soon for City Tech, I believe that we can do more together in our work with vintage computing. I floated the idea of a symposium, conference, or some other kind of connected project. Also, from what little I have learned so far, there’s a lot of investment and interest in computer technology in NYC (and Brooklyn in particular). I am looking forward to making new connections with others studying retrocomputing and New Media. I know that many opportunities await. PC Gamer offers a touching insider’s view and sendoff for Star Wars Galaxies here. Now that the license between Sony and Lucasarts has ended, Star Wars Galaxies has ceased to be. Next week, Star Wars: The Old Republic will launch (pre-orders should already have access to the virtual world); it is co-developed by Bioware, EA, and Lucasarts. One virtual world ends while another one begins. This is the apparent immediacy of the Internet-enabled present. However, the transitional switch took years in planning, production, and testing. Warning: Chuck Norris can now beat you up in World of Warcraft. N.B.–I don’t truck in Chuck Norris’ politics, but I respect him as a martial artist. I tuned into J. Haniver’s Not in the Kitchen Anymore (NITKA) after it got mentioned on Kotaku. NITKA is an extension of an earlier art project by Haniver, “a 23 year old female gamer, who specializes in first person shooters (specifically, Call of Duty).” She records conversations of (male) gamers who take issue with female gamers, and she posts the audio and transcript of those conversations on NITKA. Her experiences reveal–despite the fact that the average age of gamers is 37 and there is almost equal numbers of men and women gamers [read about that here]–there are strong currents of misogyny among some male gamers. It is important to note that she prefers first-person shooters such as Call of Duty, which mirror military combat scenarios, situations, and materiel. Are these misogynistic male gamers drawn to COD and similar games, do the games re-inscribe women-should-not-be-on-the-front attitudes, or a mixture of both? Haniver’s project to bring this to light is very important work, but how can we take this and turn it towards educating and convincing male gamers that their behavior toward women is unacceptable? Games and the Internet are not separate from real life–they are a part of life, and perhaps that is the point that we need to get across to people. Also, I wonder how this translates into other gaming communities, such as mmorpgs or competitive causal gaming.